Played at Progressive Circus 2017. In our dialogue with Pingvinorkestern’s Susanne Johansson we were both very excited to discover a common vision for a brand new progressive music project, put together for the PC17 audience. She immediately contacted her once bandmate Per Lindberg to form the nucleus of the project who will rehearse and perform a new repertoire, mainly consisting of Susanne penned prog tunes. Well, new… To quote Susanne, music is never new, but a process, where the essence of all the musicians you has previously heard or have had the honour to play with, who have surprised or impressed you, who have made you cry, laugh, dance, all become part of and are contained in the present moment when you experience the music. Susanne (sounds, vocals, violin, flute, percussion) started her musical journey with Fem i en Fiat in the 90’s, followed by Her Voice where she met Per in the early 00’s. In 2002 she entered psychedelic Drahk von Trip and explored her musicality through substantial amounts of improvisation, mainly as a violinist and singer. Since 2008 Susanne is a member of Pingvinorkestern that mixes influences from folk, prog, Zappa, Canterbury, Robert Fripp and jazz. Their debut “Push” (2014) have received rave reviews and was referred to as “one of the Best Progressive Rock Albums of this year” by DPRP (Dutch Progressive Rock Pages). Per Lindberg (drums, synths, creation of sounds and noises) is a multi-instrumentalist who just like Susanne finds music in anything that can make a sound, and tends to turns fridge humming, micro wave beeps and squeeking floors into music. He has a thorough musical background from bands like Suspected hippie in transit, Cell, Her Voice, Icoro and Desinformation. 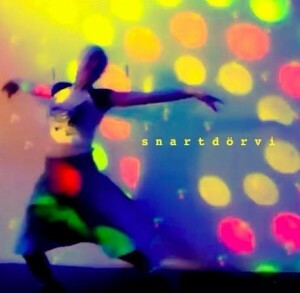 s n a r t d ö r v i uses PC17 as it’s launching platform for a musical communication that highlights the importance of finding your voice, your instrument(s) and staying clear from the norm. The name, meaning s o o n w e d i e, is chosen as a reminder that we’re alive in this present moment, and that you can choose to raise your voice, start or stop playing an instrument at any instant. s n a r t d ö r v i is equally about the fears that pollute people’s minds, and about giving a voice to those who don’t have one. The old. The sick. The fugitives. The children.